“Maharaj, here stands before Thee a humble slave. Have pity on him. His only prayer to Thee is to give him thy blessing.” The Maharshi, turning his beautiful eyes towards Ramdas, and looking intently for a few minutes into his eyes as though he was pouring into Ramdas his blessing through those orbs, shook his head to say that he had blessed. A thrill of inexpressible joy coursed through the frame of Ramdas, his whole body quivering like a leaf in the breeze. Ram then inspired in Ramdas the desire to spend some time in solitude on Arunachala Hill. Ramdas found a small cave, which he entered and settled in. 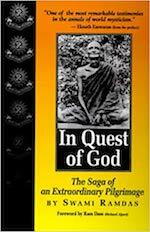 He stayed there for twenty days and twenty nights, ceaselessly repeating the mantra given to him by his guru. 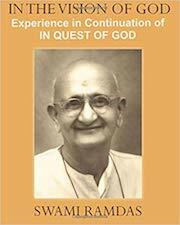 He felt most blissful sensations since he could here hold undisturbed communion with Ram. He was actually rolling in a sea of indescribable happiness. 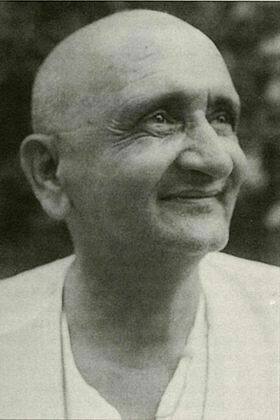 For two years from the time of the significant change which had come over him, Ramdas had been prepared to enter into the very depths of his being for the realisation of the immutable, calm and eternal spirit of God. 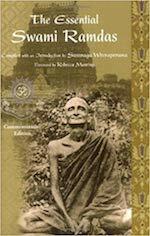 Here he had to transcend name, form, thought and will—every feeling of the heart and faculty of the mind. The world had then appeared to him as a dim shadow—a dreamy nothing. The vision then was mainly internal. It was only for the glory of the Atman in His pristine purity, peace and joy as an all-pervading, immanent, static, immortal and glowing spirit. In the earlier stages this vision was occasionally lost, pulling him down to the old life of diversity with its turmoil of like and dislike, joy and grief. But he would be drawn in again into the silence and calmness of the Spirit. A stage was soon reached when this dwelling in the spirit became a permanent and unvarying experience with no more falling off from it, and then a still exalted state came on; his hitherto inner vision projected outwards. First a glimpse of this new vision dazzled him off and on. This was the working of divine love. He would feel as though his very soul had expanded like the blossoming of a flower and, by a flash as it were, enveloped the whole universe embracing all in a subtle halo of love and light. This experience granted him a bliss infinitely greater than he had in the previous state. Now it was that Ramdas began to cry out “Ram is all, it is He as everybody and everything.” This condition was for some months coming on and vanishing. When it wore away, he would instinctively run to solitude. When it was present, he freely mixed in the world preaching the glory of Divine Love and Bliss. With this externalised vision started Ramdas’ mission. Its fullness and magnificence was revealed to him during his stay in the Kadri cave, and here the experience became more sustained and continuous. The vision of God shone in his eyes and he would see none but Him in all objects. Now wave after wave of joy rose in him. He realised that he had attained to a consciousness, full of splendour, power and bliss.